When I first discovered Charlotte Mason and read her thoughts on living books, I knew I had found a kindred spirit! Some of her other teachings were harder to implement, some we have never succeeded in introducing consistently, but her insistence on quality literature was our mantra, we were already embracing those ideals and have continued to do so. It is through the selection of excellent books with quality illustrations that we introduce our children to inspirational ideas, impart knowledge, create interests, support moral standards and surround them with rich language. We don’t subscribe to the popular thought of, “well at least they are reading something”. Books read in our home for the most, fit Charlotte Mason’s criteria. A little twaddle is acceptable but a steady diet is rather like living on candy floss instead of a diet of nutritious food. Reading the Slow Books Manifesto I was struck by this, “Literature doesn’t just make us smarter, however; it makes us us, shaping our consciences and our identities.” A reminder that we must be constantly vigilant as to what thoughts and ideas we are introducing to our children. As a parent one of my greatest privileges and pleasures is; to aid our children in finding ‘new friends’, to help them source books when following an interest, to compile booklists for unit topics or simply for pleasure. Many books we read come from our own shelves, or I search our local library catalogue, and occasionally we purchase new titles. To have fostered and watched a love of literature blossom within our children affords us great pleasure. 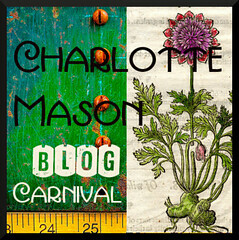 Participating in the CM Blog Carnival hosted by Jimmie’s Collage. The next CM Blog Carnival is at North Laurel. I didn't know about this other CM blog hop. I'm participating in another based on Andreola's book, A Charlotte Mason Companion. Lovely reading your posts again. It's been a little while since I've visited here. Love your posts on mapping too! Have a lovely, lovely week!! This is such a timely post, for me, as my mother and I were just discussing how truly important and influential "good books" are for our youth. It's our opinion that many have become desensitized and are titillated by anything which is seen as "exciting" or "suspenseful" with little regard to deeper story lines, agendas, and/or meanings that are being developed within a plot. 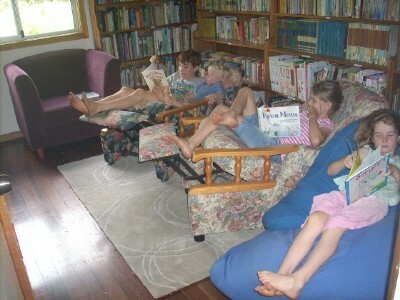 Thank you for reminding us all to incorporate quality Literature/Living Books into our family/homeschooling experience! Erin……I love reading your blog….but I rarely remember to go to lovely blogs. I do better when it comes to my email. I would really love to read your blog more fequently…..do you have any way for me to get your blog in my email? I looked around, but could not find any way. Wonderful to see you back over here:) Thank you for your kind words. Well our library is often disappointing too, so I know what you mean. Books are so influential, I well remember many books from my own youth. Thank you:) All fixed I have now added the email button and another to the left hand sidebar. That's one reason I'm really loving our McGuffey's readers. Some of the stories are somewhat old fashioned (took us a while one slow day to figure out the 'cars' were not motor cars but cars of a train) but the stories are so full of value and values. So much better and so intellectually dense compared to the drivel in modern readers. Now don't get me started on modern drivel!